When I finally see the new Star Wars film, I will be keeping my ears open. Although the initial trilogy was justly celebrated for its use of groundbreaking visual effects, for me, the sound of the films has always been more significant. Even in the woeful prequel trilogy (1999-2005), Ben Burtt’s distinctive sound design – which encompasses the hum of lightsabers, the screech of laser blasts, and the electronic language of R2D2 – helped offset the deluge of CGI and dodgy dialogue. It rooted the drama firmly in the soundworld of the first trilogy (1977-1983). But it’s John Williams’s score, that epic music that countless people know and love, that will have me most interested. Just like Burtt, Williams has been involved from the beginning of the franchise, and his music plays a vital role in the film’s narrative strategies. Despite happening in a galaxy far, far away, George Lucas rooted much of his story in the familiar. His narrative design owed a great deal to episodic movie serials such as Flash Gordon, the aerial dogfight sequences of war films, and the swordplay of Errol Flynn swashbucklers. Such was his desire to evoke something universal, Lucas even drew upon the mythological theory of Joseph Campbell. New characters promise new music. © 2015 Lucasfilm Ltd. & TM. Musically, too, the models were the scores of classic-era composers Max Steiner and Erich Korngold in which, to quote Steiner, “every character has a theme”. That’s not quite the case in Star Wars, but principal characters and ideas within the Star Wars universe are certainly connected intimately with recognisable musical motifs. The sound of the score likewise drew upon the nostalgic idiom of Korngold – an early 20th-century romanticism spiced with an understanding of modernist harmony – combined with the acerbic spikiness of Prokofiev’s ballet scores, the grandeur of William Walton’s ceremonial marches, and the aural signature of the Western. Indeed, the famous title music for Star Wars uses many characteristics found in famous Western scores such as The Big Country (1958) or The Magnificent Seven (1960), including a chord sequence known by music theorists as “the cowboy half-cadence”. Although the musical score has many functions, one of its most important roles might be to tell us something about the nature of “the Force”. The Force lies at the heart of the films’ mythology: Obi-wan Kenobi describes it as an energy field that surrounds all living things and binds the galaxy together. A hidden metaphysical realm redolent of the worlds evoked by Wagnerian music drama, it’s seemingly beyond the knowledge of all but a select few in the Star Wars universe: the Jedi and the Sith. To them, it’s an experiential reality. John Williams’s music, I find, helps us experience the Force. In some sense it may even be equated with the Force. Where Burtt’s sound design characterises the gritty world of the everyday in the Star Wars universe, the music offers us a glimpse of this hidden, mystical reality. It underpins the important moments of the films, allowing us to hear the heroism of Luke Skywalker or the menace of Darth Vader; it characterises the essential excitement of an attack on the Death Star, and the love between Han Solo and Princess Leia. And just as Yoda tells Luke that “through the Force, things you will see. Other places. The future, the past; old friends long gone”, so music may appear to anticipate events or look backwards. Yoda’s distinctive theme, for example, is heard many times during the Cloud City scenes in The Empire Strikes Back, even though the character himself is not present. Those characters who are strong with the Force, we might reasonably assume, have direct access to this musical realm. And since we as an audience undeniably hear the music too, we are perhaps encouraged to feel similarly strong with the Force. We share our experience of this musical galaxy with the characters. So, what can we expect from the new Star Wars film? 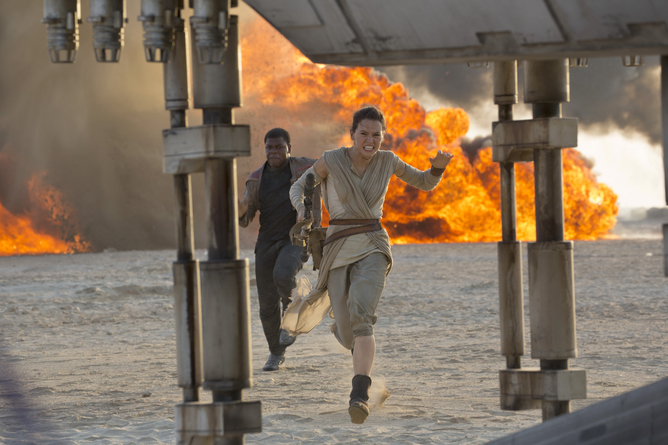 The subtitle The Force Awakens suggests another rich slice of space opera, and the return of the original trilogy’s characters will undoubtedly prompt the appearance of their musical themes. Williams, though, has been skillful in showing aspects of character development in his music: the harmonic signature of the Imperial March, for instance, appeared latent in Anakin Skywalker’s theme throughout the prequel trilogy, revealing his future as Darth Vader. In a story set 30 years after Return of the Jedi (1983), I wonder how our original cast of heroes will have changed, and to what extent Williams’s score will reflect that or nod nostalgically back to their (and our) past? New characters also promise new thematic material, adding to the rich tapestry already created. Director J J Abrams has promised us traditional effects and physical sets rather than soulless CGI (thank goodness), but the music will be the defining factor for me as to whether the new film constitutes a worthy entry in the Star Wars series. I can’t wait to hear what a reawakened Force sounds like.